Adding narration to a presentation can be a great way of enhancing web-based or automated presentations. It’s also handy way to make presentations available after they have been delivered so that people who weren’t able to attend at the time can still listen back at a later date, and hear the presentation as well as view the slides. 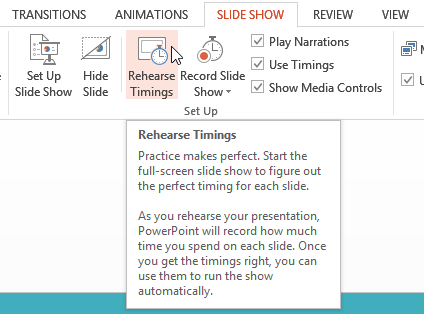 PowerPoint 2013 offers recording options where you can record and narrate a slideshow, allowing you to set the pace of the slides and take as much time as you need for each one. There are two ways of adding a narration. You can record the narration separately and add it to the presentation, with preset timings between slides, or you can record your narration whilst working through the slides to create a fully narrated presentation. With this feature, your presentation will be played back the same way that you recorded it. The benefit of narrating a slideshow is that you can time yourself appropriately. You can then play the slides as is when the slides are narrated with your voice without the need to fiddle about with slide timings. Click the Slide Show tab > Set Up group > Rehearse Timings. Your presentation will now start right away. Once in rehearsal mode, you can rehearse through your slideshow, advancing the slides once you have finished speaking, in order to set the timings between your slides. Notice the recording toolbar that appears at each slide. Use the right key on your keyboard or click the right key on the toolbar when you are done practicing the first slide. In this way, once you have completed the entire presentation, you’ll see a dialog box which shows the total time recorded for the presentation. To save the timings, click Yes. You can always pause the presentation by clicking the pause button on the toolbar. Click the repeat button to re-record the entire presentation. The Record Slide Show feature is not much different from the Rehearse Timings feature, but with this option it provides built-in voice narration option too. If you have a good quality mic and feel confident to record your presentation while rehearsing, use the Record Slide Show feature. The mouse wouldn’t show up while presenting. A dialog box will appear and you can start narrating and recording your presentation. Click Start Recording. Now you can start to narrate your slideshow and your speech will be recorded. Click Next to move ahead to the next slide. Click the Slide Show tab > Set Up group > Record Slide Show. Then from the drop down options choose Clear. From the next menu, choose your option. You can select to Clear Timings on All slides or if you want to clear timing only from the current slide, click Clear Timing on Current Slide. Next articleCan Video Improve Your Website Ranking?